Washington - What do Ilhan Omar, AIPAC, the Forward and the ZOA have in common? They’re all using the same controversy to ask for your money. For those who haven’t been on the internet this week, here’s a recap: Omar, a Minnesota Democratic congresswoman, tweeted that politicians were being paid to be pro-Israel. Batya Ungar-Sargon, the opinion editor at the Forward, wondered who, exactly, Omar thought was paying the politicians. Omar’s response: “AIPAC!” That would be the American Israel Public Affairs Committee, a major pro-Israel lobby. Politicians on both sides of the aisle denounced the freshman lawmaker’s tweets as an echo of anti-Semitic stereotypes involving Jewish money and power. She apologized. Then President Donald Trump called on Omar to resign. And now the controversy has led to fundraising on all sides. The Zionist Organization of America sent out a pitch saying it “does not accept her recent phony apologies since she has continued her ugly anti-Semitic statements.” Omar appealed to people who considered Trump’s intervention hypocritical after his and other racially charged comments by Republicans. The Forward, whose opinion editor’s challenge helped spark the controversy, called on donors to help a legacy Jewish newspaper hold politicians to account. AIPAC said Omar’s actions were examples of how Israel is under attack and urged supporters to “renew your commitment to this important work today by clicking here,” offering suggested dollar amounts. The AIPAC appeal appeared in an email. The email went on to reference times when Trump was accused of supporting bigotry, including in 2017, when he said there were “very fine people” on both sides of a standoff in Charlottesville, Virginia, between white supremacists and their protesters. “Donate now to send a message to those who want to smear our movement and silence our voices,” the Omar email said. The email also incorrectly identified Omar as a congresswoman from Michigan instead of Minnesota. In addition to being another Midwestern state beginning with the letters “Mi,” Michigan is home to the other freshman Muslim congresswoman, Rashida Tlaib. The Forward corrected the email an hour later, but it was too late for some denizens of Jewish Twitter — and progressive Jews in particular, who castigated the left-leaning paper for the email and perhaps confusing Omar and Tlaib. Like most nonprofits, Jewish organizations regularly fundraise off events that touch on their business, some taking more credit than others. Although the current Omar controversy was sparked by a round of tweets among Omar, Rep. Kevin McCarthy, R-Calif. (the House minority leader and former majority leader, who threatened “action” against Omar), Ungar-Sargon and Glenn Greenwald of The Intercept news site. The Zionist Organization of America took credit for “exposing” Omar. 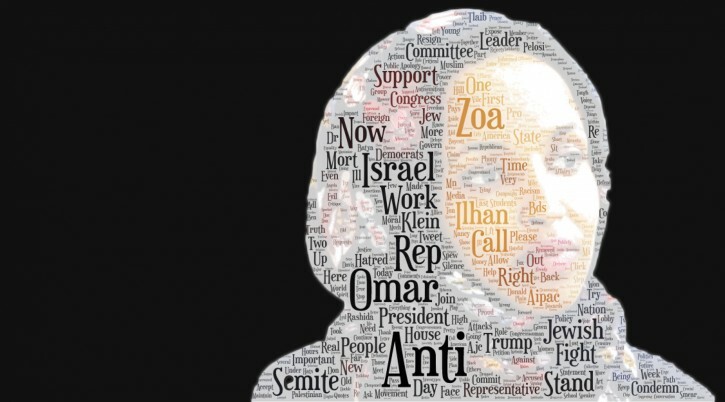 “By now you may have heard how the ZOA and its President Mort Klein exposed Rep. Ilhan Omar for the vile, anti-Semitic and Israel hatred that she has spewed,” a Wednesday fundraising email from ZOA said. The American Jewish Committee, another major Jewish group that advocates for Israel, didn’t take credit for being part of the controversy. But AJC did note, in a fundraising email Thursday, that it brought a delegation of high-school students to lobby on Capitol Hill as the scandal was unfolding — and that the students called on officials to condemn Omar’s statement. The Anti-Defamation League also sent out an email Tuesday highlighting its work around the controversy, with a donation button reading “Support our work” in the footer. The Omar controversy was a fundraising opportunity for anti-Zionist groups as well. In a fundraising email Thursday, Jewish Voice for Peace said the attack on Omar reflected anti-Semitism “being cheapened as it is weaponized to suppress and deny important political realities.” JVP said Omar was “attacked for speaking the truth,” along with other people of color who have criticized Israel. Its email included a “Donate Now” button. watch her grill abrams. such venom, such hate. please please vote her out at next election - congressmen have only 2 year terms.